Tracey at Clover posted this fun survey with her answers, which I really enjoyed, so I thought I'd jump on the bandwagon! Here it goes! knit best Alone or in a group? Definitely alone! I've tried to join the knitters group during lunch at work, and I get too distracted so I end up frogging any progress I make. I am also very self-conscious about anyone watching me knit. So I often join them, but just chat while they knit. Best thing you've ever knit? A soccer player teddy bear for my daughter when she was in high school in her school colors with her jersey #. It was one of the first projects I made, and I surprised her with it. I'm still very proud of and sentimental about that bear! I'm partial to DPNs I guess because that's what I learned to work with for the first pair of socks. A lace wedding shawl, specifically Jared Flood's Leaves of Grass pi shawl, as inspired by @kaygardiner. It wouldn't even necessarily need to be for a bride, just a special heirloom. Watching my Grandma Bower knit with brown acrylic yarn in her recliner rocking chair on Sunday afternoons when I was a kid. any other Family members knit? Not currently! My grandma knit and crocheted when I was a kid. My mom crocheted beautifully, but did not knit, and my sister also crocheted, but dishcloths only. rather knit Gloves or socks? knit best at Home or can knit anywhere? I only knit at home. I've tried to knit in public, with a group, in the car, etc., and I end up getting off track and making too many mistakes. I wish I were able to knit anywhere, any time, but that doesn't work for me. fair isle, Intarsia... favorite color work method? I've not attempted color work yet. Too many other skills to learn, but I'll get there! Loyal to knitting or fan of many crafts? Knitting will always be #1, but I'd like to become at least proficient with crochet, and I am loving the coloring books for adults! Does blogging count as a craft??!! I'm pretty low-drama, so catastrophic is a strong way to describe it, but early on I made the Purl Soho Super Easy Baby Blanket. Simple garter stitch in seven colors. So the blanket turned out fine, but then I decided I wanted to add an i-cord border, which ended with my first attempt at Kitchener stitch. I totally wrecked it and didn't know enough to frog or fix. I gave the blanket to the cat, but later on threw it away! Next project in the knitting queue? I'm going to say the ZickZack Scarf, although I've cast on and knit about 2" of it already, but have a long ways to go! And there's always a dishcloth in my near future! One, or a dozen projects on the needles at once? Oh, at least a dozen! I am definitely a process knitter. Seriously, I count seven WIPs in various bags around the house. best Pattern you've ever followed? The Sunburst Dishcloth, just because I felt so clever once I figured it out! 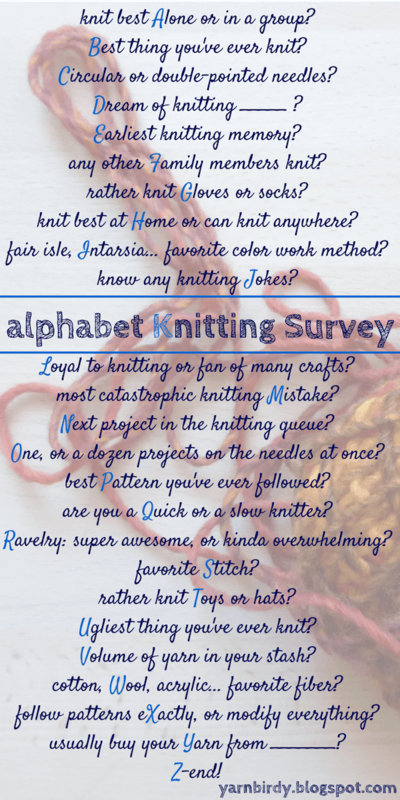 are you a Quick or a slow knitter? Ravelry: super awesome, or kinda overwhelming? Super awesome! I've made many friends there, especially my BFF Sharon! It's a tie between kfb (knit in the front and back) and knit in the stitch below (bee stitch). Both make me feel smart and advanced! rather knit Toys or hats? Hmmm, really neither, but maybe hats for babies or little kids. Ugliest thing you've ever knit? Many of my early projects are not documented because it was before I joined Ravelry. But there were many failures, however I'm sure that's true for most knitters! Volume of yarn in your stash? Compared to others, my stash is very very small. It's mostly yarn for my WIPs. cotton, Wool, acrylic... favorite fiber? I'm very partial to cotton, since I live in a warm climate. But any good quality yarn, especially a dk weight, is much appreciated. follow patterns eXactly, or modify everything? Exactly . . . for the most part, I trust the designer and pattern writer. I don't have enough experience to be messing with it. usually buy your Yarn from _____? Either my LYS or favorite online stores, Churchmouse Yarns, The Yarnery, and Eat.Sleep.Knit. August has been bigger than I could have imagined, and it is only getting started! 1) it's my BIRTH MONTH!!! I've always loved celebrating my birthday. As a kid in Wyoming, my birthday usually landed smack dab in the middle of the Goshen County Fair and Rodeo week. On the best years, it would be on the day of the big parade down Main Street. Everyone in our family got dressed in their new fair and rodeo clothes, new cowboy boots, cowboy hats, the works! There was a carnival in town, 4-H booths, and the Elks and Moose Clubs stands that served corn-on-the-cob, most of it donated by my dad straight from his cornfields. I have the best memories of that small-town life, and I'll always miss it. Donna, my fav cousin, sent us these travel coffee mugs this week. LOVE them! 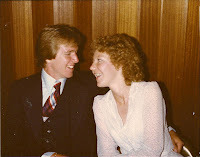 2) it's our Wedding Anniversary!!! Steve and I have known each other since 4th grade and started dating in 9th grade! Our marriage is another wonderful product of that small town. We celebrated our anniversary with our family and best friends at a new-to-us restaurant in the Historic South End area of Charlotte, Nan and Byron's. We were escorted in style, and the destination was a surprise. The week leading up to that we finally had our beach vacation at Isle of Palms, SC, which is near Charleston. I'll throw in some photos below. It was perfect, we sat on the beach, ate great seafood, and just relaxed. Steve took much better photos than me, so please take a look at shoofography.com. 3) it's my Work Anniversary!!! Cheers to 34 years in higher education administration! I've had the privilege to work at three very different institutions with 8 presidents and reporting to 13 distinct vice presidents. My job is not glamorous, but I'm very proud of those years of service. I'm celebrating all of the above by having taken the first two weeks of August O.F.F.! The week at the beach, and now a week at home just doing what I please and being my own boss. Tonight, we've been invited to our daughter's home for dinner. She is an amazing cook, and she has a way of finding a recipe on Pinterest and bringing it to life in the most exquisite way. I always bring the dessert, so I'm making a peach-blueberry crisp with vanilla bean ice cream. I'm also going to try a new appetizer using basil from Steve's garden, Tortellini, Pesto & Mozzarella Skewers. While you go and look at the recipe, stop and take some time to look around Alissa's blog, 33 Shades of Green. I would recommend you block out a bunch of time, pour yourself a beverage, and start in her archives from the very first post. She has an amazing site full of incredible home decor, recipes, crafts, etc. Find her on Instagram (@33shadesofgreen) where she posts breathtaking photos from around Lake Michigan. I'm a big fan of hers! There will be more to report. I'm about an inch in on the ZickZack Scarf, after numerous restarts. I have my groove now, but not enough yet to share a photo. The colors are going to be beautiful! It takes me awhile to get the feel for a new yarn and pattern. Some years August comes in like a lion, but fizzles out towards the end. I am not going to allow that to happen this year, lol!